the knit skater dresses have been über popular around the blogs, and for good reason. 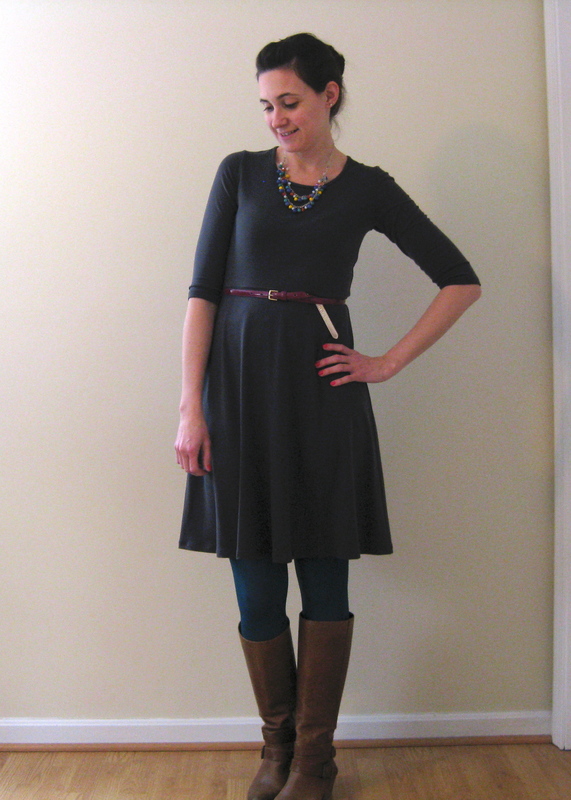 in the quest for everyday wearable clothes, few things are more comfy than knit dresses. i decided to go with dixie DIY’s ballet dress. and really, how has this pattern not received more love? i’ll give up $4 to avoid drafting my own, that’s for sure. 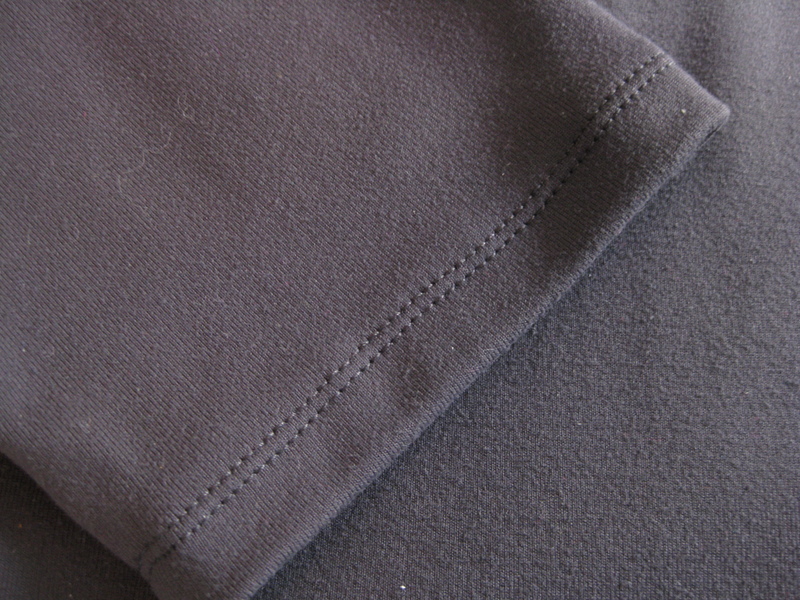 there is only one sleeve length in this pattern (3/4 length) but you could easily shorten or lengthen as needed. i should say, this was probably one of the fastest .pdf files i have ever put together. i managed to cut and tape while playing a rousing game of candy land with my son. multitasking at it’s finest. the pattern size chart is simply a list of finished measurements. i find this particularly helpful with knits since the stretch of your knit can vary so widely. i used a grey poly/lycra ponte. i know, i know… ugh polyester… it just felt so nice i thought i’d give it a shot. plus it was only $4/yd. as far as sizing goes, i decided to grade from an XS up top out to a M at the waist. this worked out great, though i have a little bit of pulling on the sleeve at the underarm. the shoulder seam may need to come out a touch, and perhaps the armhole scooped out in the front a tad. the waist seam hits me right at my waist in the back, but hikes up a little in the front. i think next time i’ll add about 1/2″ to the front bodice length. also, i cut the skirt 1″ longer than my size dictated to compensate for my height. these are all minor adjustments, and i’m perfectly content with how this one fits. i had planned to do a neck band finish, but when i tried it on for size i was happy with where the neckline was sitting. i decided to bind the neckline edge by serging a strip of fabric to the right side, then wrapping it to the back and top stitching. i was a rebel and used a regular straight stitch. the stitches pretty much disappear into the fabric giving me a nice neat neckline. then i finished off the sleeve and hem with my twin needle. i really love this dress and am already plotting several more. i know it’s been said ad nauseam, but this really is a perfect style so if you haven’t sewn one up yet, what are you waiting for? thanks, and i highly recommend this pattern! it’s like the basic tee of dresses. Very cute and a great dress to accessorize! thanks! it is nice to have a good layering piece. ooooooooo! I’ve eyed Dixie DIY’s patterns before, but you’re right, they don’t get a lot of blog love. I can’t stop admiring that neckline. I’ve only just perfected my neckband technique, and am afraid of straying and relearning… but I like your bound look so I’m going to have to try that and branch out! Lovely, and super impressed by your beautiful stitching! Nice dress! It looks like something you can casually wear, and feel chic in at the same time! I have a question about using the twin needle. I have used it often while sewing knits, and wonder how you get such a nice smooth result from yours. I have adjusted the tension on my machine, but I still think it could look better. Any help would be appreciated! thanks! 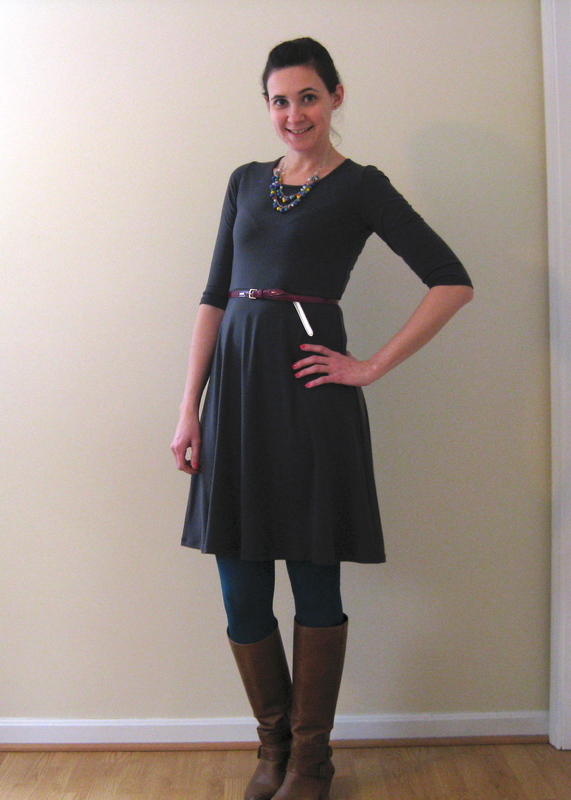 the twin needle can be a real hit or miss… mostly it’s about the fabric. this is a nice stable knit so getting a smooth finish is fairly easy. generally, i use my regular presser foot, a 3 on stitch length, and crank up the tension to get the bobbin to zig zag on the underside. on a thinner knit, sometimes it works… sometimes it doesn’t. i haven’t tried any stabilizers in my hems, but many people swear by it! It is a very nice dress. Yet another one to add to my list of 1000 things to do! i know how it is! this is a nice palate refresher in between more involved projects since it barely takes more time than a t-shirt. Very cute. I really must give this style a try this winter and you can’t a $4 pattern. it really is a bargain, and easy to tweak for sizing as needed. thank you! You know I love this pattern! I really like how you did the neck binding. Might have to steal that for a future version! 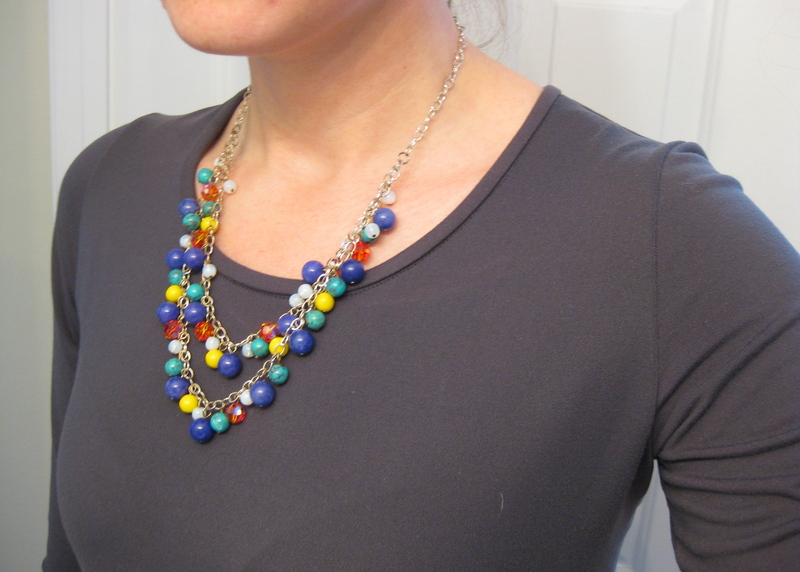 this neckline finish is super easy, i highly recommend it! and i believe it was your versions of this pattern that reminded me to put it on my to-do list! i’ve been ogling this dress for ages, this might push me over. and i love that necklace, looks like candyland! Very cute! I love the grey brown color. thank you! this would be a great pattern for you–very fast to make! Love it! I had forgotten about this pattern and am off to reconsider since I just love this style of dress on everyone who makes it! Your dress is fabulous, and will go with everything! This is lovely. Your neckline finish is great. I’m seriously tempted by this pattern now. This looks great on you! It reminds me too that I really need some non-print fabrics. I’ve made two Lady Skater dresses both in prints but I think you can really change the look up on this so much more easily. Yeah to $4 dresses – even ON can’t beat that! I’m glad I jumped over from SPR to see your lovely, meticulous stitching. A great project. This is the perfect staple dress!!! I love the color, and the fit is great 🙂 Wondering how it compares to Kitschycoo’s Lady Skater dress pattern! thanks! i think the biggest difference is in the bodice length–this one is designed to hit higher on the waist than the Lady Skater.